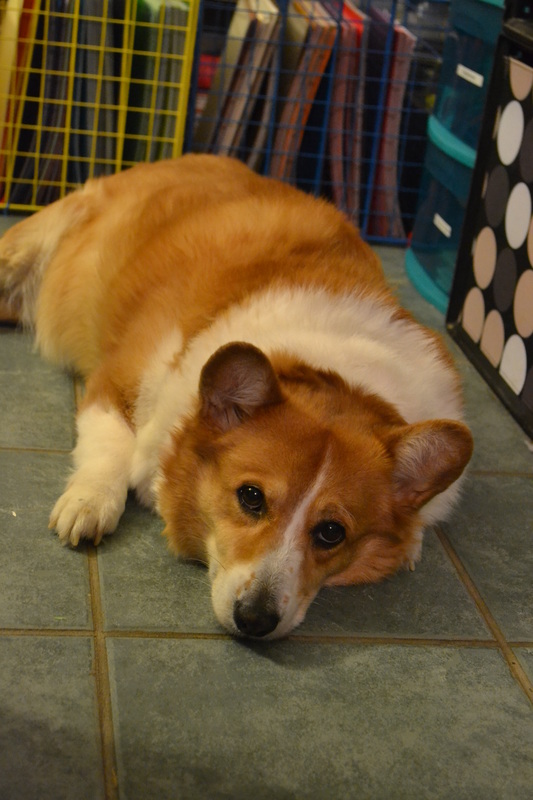 My Little Fat Corgi – Miss Rita to the Rescue! November 13, 2015 November 13, 2015 Miss Rita to the Rescue! I’m a big fan of corgis. You know? Those short dogs. The ones that look like midget dogs? The ones that the Queen has? Yes, that’s as tall as they are going to get. Yes, it’s completely normal. Yes, sometimes they have tails and sometimes they don’t. The ones with the tails are called Cardigans and the ones without are called Pembroke. Most of the tail-less ones are born that way, but sometimes they have nubs. And it doesn’t make any difference to me if they have a tail or not! I love corgis of all kinds, colors, tail or no tail. I adore anything corgi related. I tweet “corgi alerts”. I search Target for corgi ornaments. I own corgi socks, and pillows, and shirts and even an umbrella. I even have make corgi bumper stickers. Corgis are a “thing” on the internet these days. Of course, they should be. If you haven’t ever known one, I know you are probably saying I’m just being a breed snob or something, but I am really not. To coin a phrase: “Once you go corgi, you never go back!” Well. It’s the truth. I’m just pointing it out. It’s so important to me that you know, too, that I was into corgis before they were an “internet sensation”. I’ve been living with corgis since before the millennium. So, ya, a long time. But for those of you that are sort of new to the breed, please don’t call my corgi “fat”! It’s like openly calling a person’s child fat, which I’m sure you don’t do. Right? I know some people can’t help themselves. I know some mean it in a loving way, like my neighbor did. Some people even prefer their corgis fat. But it really hurts my feelings when I’m walking my weight-challenged corgi, Odie, and someone points out how HUGE he is. Or maybe they compare him to my corgi puppy, Ted E. Bear, who is gorgeous and sleek and perfectly shaped. Or they see how he really does waddle like a penguin. It hurts my feelings, because some people don’t know Odie’s story. They don’t know how Odie couldn’t even walk up stairs when he first arrived. Or how hard it has been trying to get him to take a walk with me. Most don’t know Odie was dropped off here severely overweight for “just a few months”. But then the few months became 9 months. Then a year. Then maybe not until 2016. So…basically abandoned. Until I couldn’t watch him struggle anymore and asked my friends from Corgi Nation for help. Together with Faith Bark, Corgi Nation came through for me as they do for hundreds of other corgis. Through Faith Bark’s “Bandit’s Band-aid” program, many friends of Corgi Nation contributed so I could have Odie get medical attention. Yes, those are really groups. Corgi Nation–or CN, for short–is as big and weird and fun and sometimes even a little coarse as the beloved Red Sox Nation. Dare I say it? Maybe even stronger? We corgi lovers are a varied but vast team of people that live across the nation and around the world. We send hundreds of Christmas cards to each other each year…with our corgis pictures on them, of course! Yes, Corgi Nation is probably responsible for keeping the USPS afloat these past five years or so. And, yes, I am being completely serious! Except for my friends in Corgi Nation and a few select other “real life people” (hate that…having to separate my friends into online or “real life” status) most people don’t know a few other key details. They don’t know that, only a few months after Odie came to visit, I lost my sweetest friend, Ollie, a corgi (of course). A rescued corgi, too, with medical issues. Oliver…my “dandy” with the glamour coat. The corgi that gave Master Owen his official “Master” status. Then–only four months later in March of this year–I lost my girl, Beatrice. Yes, of course, she was a corgi, too. Bea was also a rescue. She was so sassy we had to give her the title of “The Queen Bea”, which she embodied until the day she died. Complications from an infection, which she got because she had diabetes. Diabetes that took her sight and made me give her insulin for several years. Yes, The Queen Bea was mostly blind in the end and, yes, fat. But she was so sassy and royal, it hardly bothered me when people would say so. She wore her fatness like the crown she was born to wear. I’m not sure why it hurts so much when folks call Odie “fat”. Maybe it’s because I’ve had too many losses the past couple of years. Maybe I feel bad for him. Maybe I wonder how anyone would ever abandon a corgi…ever. Maybe it’s just because I’ve been working so hard with him. You know, he is making progress. Today he lifted his leg to pee on a hydrant. Today he walked a little further. Maybe folks don’t see it. Maybe they just see a waddling, short dog and think it’s funny. I see a dog that had the rug pulled out from under him and is still trying to work on his problems anyway. I see a dog who gets up every day–even if he is sore and super hungry and tired of eating green beans with his quarter cup of kibble–and tries to be better. Tries not to eat the puppy’s leftovers. Looks at me with adoring eyes, because he knows I understand. Previous Post How exactly do we “support” our troops? Loved this story! While I know much of the story from us being “fb friends” , loved reading it all together like this. I really do enjoy reading your blogs! You definitely have a gift! Thank you SO much for your feedback and encouragement, Johnnie! It really helps! I loved this entry! I am beginning to believe I too am a ‘fat little corgi’ who just happens to look like a human! BOL! !